The last couple of weeks, my Chinese friend Shasha and her dog 王子 (Wangzi, meaning Prince) have been staying in our living room while apartment-hunting. 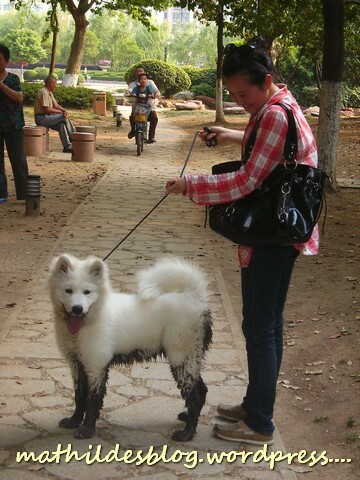 Wangzi is a 5 months old Samoyed puppy. A big puppy.. Bigger than many dogs ever get. As a dog bred to pull sleds in the North, he has way more energy than a small China apartment can contain, and this energy has largely been unleashed on our indoor slippers (we used to have several guest pairs, as it is custom to take of your shoes inside, but to cold in the winter to not wear shoes). The other day, Rosie and I took Wangzi along to the night market, where we invested in a fan. It had been drizzling for some time that evening, and while we were there it started pouring down, soaking all three of us. Wangzi especially enjoyed the welcomed rain, as we’d had a few days with temperatures reaching 35 degrees (Celsius) and humidity percentages of around 95 %. Wangzi entertained himself all the half-hour long walk home by jumping through, sitting down in and dipping his head into all the puddles he could reach. 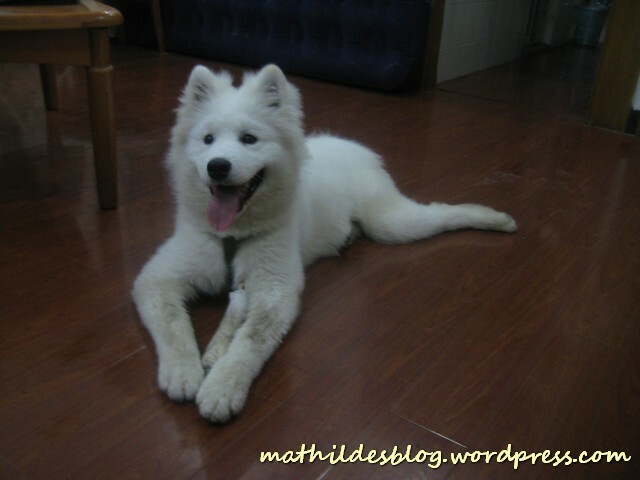 So by the time we reached home, he was more gray than his usual white. Rosie and I decided it was time for a shower, and as he usually go to dog saloons to get washed, this new experience did nothing to calm down his excitement. Wangzi ended his evening with chewing up the cardboard box our recently acquired fan had come in, which is one of his more acceptable choices of chew toys. Wangzi and Shasha are a lively and warmly welcomed addition to my weeks! But as the apartment has not been clean or tidy since Wangzi moved in, I think it will be ok to see them off to their new place when they find one. They will be missed though.